Holden Street Theatres, The Studio, Wed 13 Oct.
Matt Byrne Media has been churning out consistently good local theatre for years now and they have excelled with this production of Reginald Rose’s timeless jury room drama 12 Angry Men. Appropriately timed to coincide with the madness surrounding the US election and the racist fear-mongering attitudes it is serving up 12 Angry Men reminds us of the fault lines of prejudice that underscore American life. This production is a superb example of great casting and near faultless ensemble acting. Twelve men of all ages from many and various walks of life are closeted in a jury room to decide the fate of a 16-year-old Puerto Rican boy on trial for the murder of his father. The initial vote goes 11-1 in favour of indictment. The dissenting juror number eight however is not convinced the evidence presented was conclusive and begins a round of discussions that slowly sow seeds of reasonable doubt in his fellow jurors. The crisp, fast moving dialogue is in turn rational, impassioned and heated and reveals that people have made decisions based on the values they hold rather than on the evidence that is presented. A salutary lesson in Courtroom Law 101. There is not a weak link among the twelve characters. While some have more demanding roles, they all play their parts to perfection and it would seem unfair to single out any of them for special mention. It is possibly the most even ensemble performance I’ve seen in years. There were many startling and memorable scenes. The opening scene that sees twelve random strangers awkwardly filing into the jury room for a process that would reveal much about who they are and what they believe, and ultimately decide whether someone lives or dies was beautifully choreographed. A scene late in the play when one of the more outspoken guilty verdict jurors unravels in a tirade of racism was eerily Trump-like. Ultimately, after a fiery, combative process reason triumphs and justice rules, and shows that those who shout loudest need not always get their way. Designed and directed by Matt Byrne, this is a classy and immensely entertaining show. 12 Angry Men continues at Holden Street Theatres, The Studio, at various times, until Sat 29 Oct.
Book at mattbyrnemedia.com.au and 8262 4906 or at holdenstreettheatres.com and 8225 8888. 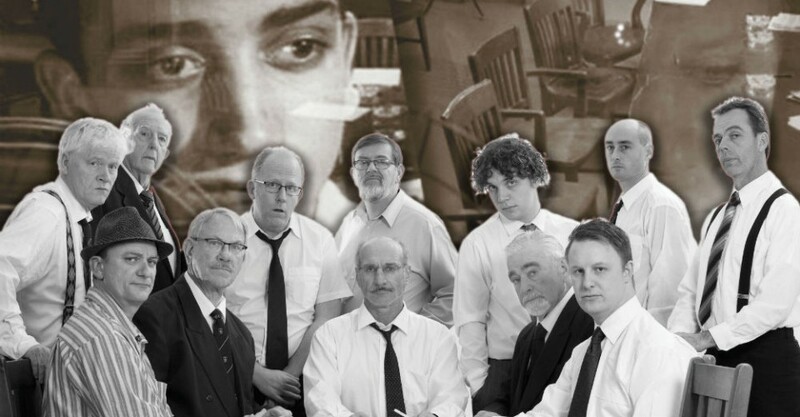 Holden Street Theatres, The Studio, Wed 13 Oct. Matt Byrne Media has been churning out consistently good local theatre for years now and they have excelled with this production of Reginald Rose’s timeless jury room drama 12 Angry Men. Appropriately timed to coincide with the madness surrounding the US election and the racist fear-mongering attitudes it is serving up 12 Angry Men reminds us of the fault lines of prejudice that underscore American life. This production is a superb example of great casting and near faultless ensemble acting. Twelve men of all ages from many and various walks of life are closeted in a jury room to decide the fate of a 16-year-old Puerto Rican boy on trial for the murder of his father. The initial vote goes 11-1 in favour of indictment. The dissenting juror number eight however is not convinced the evidence presented was conclusive and begins a round of discussions that slowly sow seeds of reasonable doubt in his fellow jurors. The crisp, fast moving dialogue is in turn rational, impassioned and heated and reveals that people have made decisions based on the values they hold rather than on the evidence that is presented. A salutary lesson in Courtroom Law 101. There is not a weak link among the twelve characters. While some have more demanding roles, they all play their parts to perfection and it would seem unfair to single out any of them for special mention. It is possibly the most even ensemble performance I’ve seen in years. There were many startling and memorable scenes. The opening scene that sees twelve random strangers awkwardly filing into the jury room for a process that would reveal much about who they are and what they believe, and ultimately decide whether someone lives or dies was beautifully choreographed. A scene late in the play when one of the more outspoken guilty verdict jurors unravels in a tirade of racism was eerily Trump-like. Ultimately, after a fiery, combative process reason triumphs and justice rules, and shows that those who shout loudest need not always get their way. Designed and directed by Matt Byrne, this is a classy and immensely entertaining show. Michael Coghlan 12 Angry Men continues at Holden Street Theatres, The Studio, at various times, until Sat 29 Oct. Book at mattbyrnemedia.com.au and 8262 4906 or at holdenstreettheatres.com and 8225 8888.